Come to John Hinkel Park and participate in the fable of the Chalk Circle! See two women claim the same child! Who is the real mother? A stranger who risks everything, or the mother who abandons her child, then changes her mind? Will the judge Azdak take sides with Grusha the peasant or with the Governor's wife? How will this age-old parable be played out? Consider yourself invited to the devil's own mix of epic drama, folk music, politics and mayhem. The Caucasian Chalk Circle is a parable inspired by the Chinese play Chalk Circle. Written at the close of World War II, the story is set in the Caucasus Mountains of Georgia. It retells the tale of King Solomon and a child claimed bsy and fought over by two mothers. But this chalk circle is metaphorically drawn around a society misdirected in its priorities. Brecht questions the effects and consequences of war as well as the individuals role and responsibility in this lively and biting satire. Politically savvy, wickedly humorous and filled with music, The Caucasian Chalk Circle holds at its center the resilience of the average worker. The Shotgun production begs the question: how can you live a prosperous, dignified existence in the middle of a war zone? Or, how do you keep your barbershop open in Baghdad, Port-au-Prince or Sarajevo? This production is dedicated to people from all over the world who are being forced into this position. Shotgun continues to use theater to inspire, awaken and ask difficult questions of our audience members. This play is especially relevant as our current political state remains so volatile. Chosen as Shotguns summer production when June 30 was the supposed handoff date for Iraq to take back over the governance of their country, it is all too relevant to experience a world where people are struggling in the aftermath of a landscape ravaged by war. The Caucasian Chalk Circle asks the audience members to question the individuals role in a country recovering from war. However, the seriousness of the theme is coupled with the highly entertaining and magical way the story is told. With live music, food, families and free admission, a real sense of community is created in the park during our summer productions. With Brechts characteristic skill with razor-sharp political satire, The Caucasian Chalk Circle promises an experience that is as quick-witted and humorous as it is heavy hitting. The Caucasian Chalk Circle will feature fifteen live musical numbers headed by Shotguns award-winning musical duo Daniel Bruno and Josh Pollock. Rough and Tumble Artistic Director Cliff Mayotte will direct the talented ensemble of 8 local actors and 2 musicians, including Shotgun Players Trish Mulholland (last years Mother Courage), John Thomas, Andy Alabran and Daniel Bruno. This age-old fable promises to be the politically relevant, joyful and entertaining romp that our audiences have come to expect from Shotguns outdoor summer show. Director Cliff Mayotte has been working in the Bay Area as an actor, director and arts educator for the past fifteen years, but this is his first work with Shotgun Players. Last year Cliff staged a critically acclaimed revival of Eugene Ionescos The Chairs for Aurora Theatre Co. Cliff has also staged plays for The Marsh, Marin Shakespeare Company, Playground's Emerging Playwright's Festival, Eureka Theatre, Signal Theatre and the Festival of Irish Women Playwrights for the Magic Theatre. He is currently the chair of the Performing Arts Department at Lick-Wilmerding High School in San Francisco. Click here for a map to John Hinkel Park. Take the #7 AC Transit Bus north from Downtown Berkeley BART station. Once you pass the Arlington Circle, watch for our billboard out on the corner of Arlington and Southhampton Avenue. Sometimes the seating at John Hinkel Park can be a little bumpy or twiggy. We recommend bringing a blanket, pillow or old beach chair to make your experience more pleasurable. We cook homemade vegetable stew and sausages every day - so if you forget to pack a picnic - we've got it covered. Sofia Ahmad in Shotgun's summer production of The Caucasian Chalk Circle. 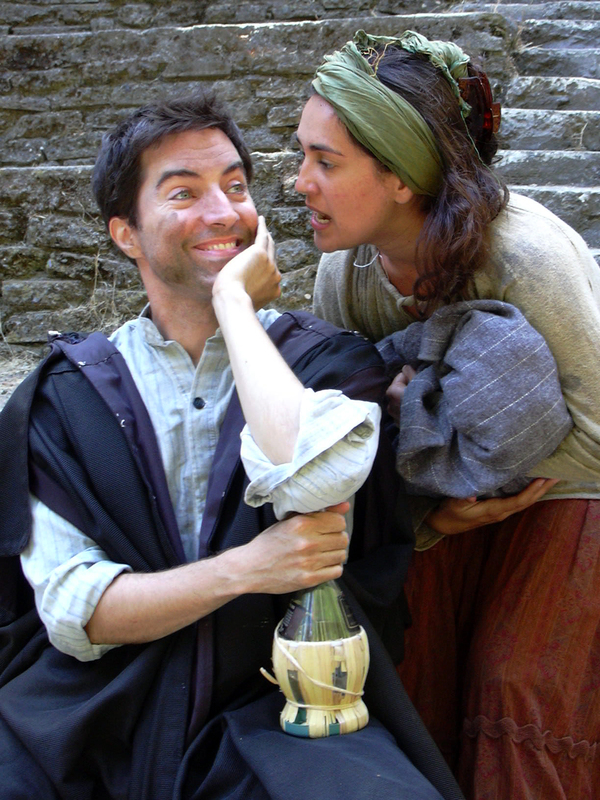 Andy Alabran and Sofia Ahmad in Shotgun's summer production of The Caucasian Chalk Circle.